Today I've got to share with you my very first Girly Bits polishes, and let me tell you, these didn't disappoint. 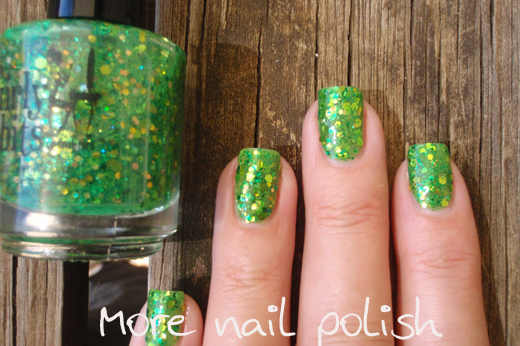 Erin go Bragh-less (which is a fun play on the Anglicisation of an Irish phrase, Éirinn go Brách - which is used to express ones allegiance to Ireland), is a bright grassy green jelly glitter. 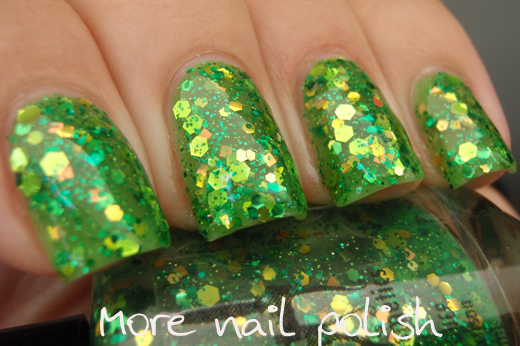 It has lots of green, gold and coloured holo glitter of various sizes. 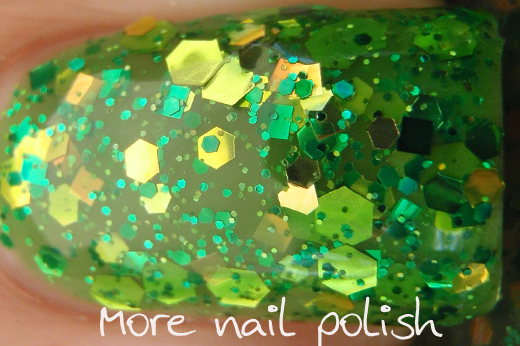 It's easily buildable on it's own or perfect for layering. I chose to wear it on it's own to bring out the full squishy jelliness. Application was great, formula was excellent and there are no tacos in this chunky leprechaun mix. 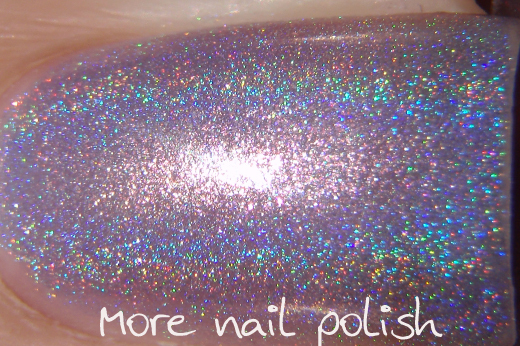 This is three coats with Ozotic Mr Big High Gloss Top coat. 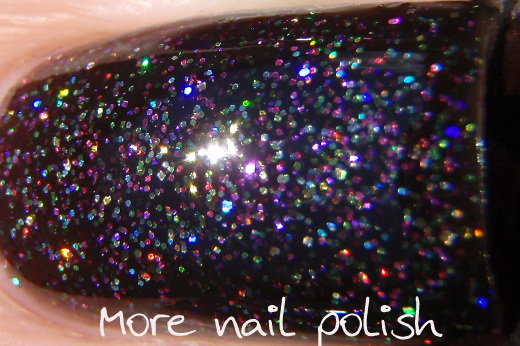 Into the night- a blackened jelly base packed full of multicoloured and holo glitter. 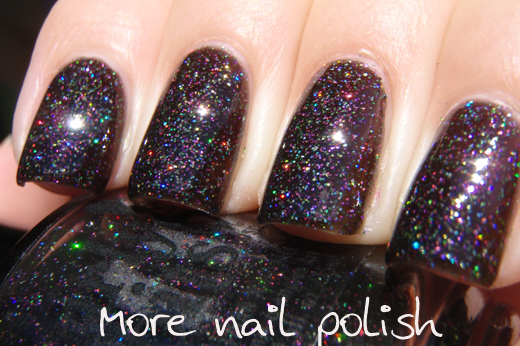 At first I thought this was just holo glitter in a black base, but it's actually much more complex than that. 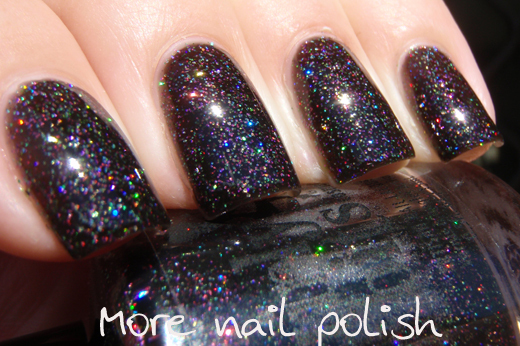 With holo glitter in a black base, when you indoors its looks like silver glitter in black. 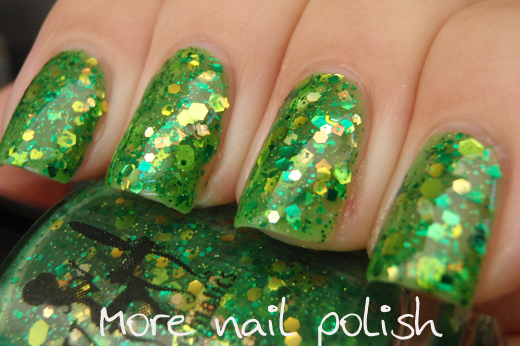 This is actually multicoloured glitters, so when your indoors you still see lots of coloured glitter, not just silver. Again the formula was great, this was three coats with Ozotic Mr Big High Gloss Top coat. 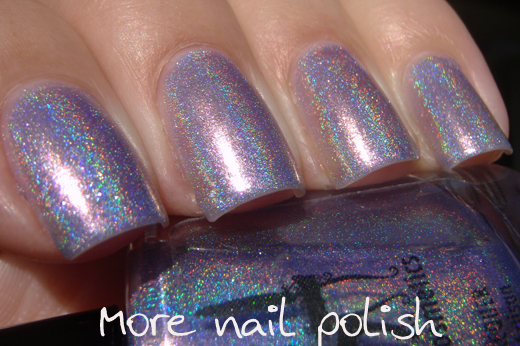 Twitterpated is a pale mauve foil holographic.I love holos that have the metallic foil combo, cause it means they are still flashy when indoors, rather than flat and dull. 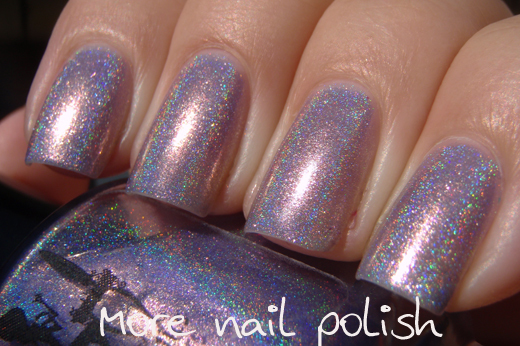 The color and appearance of this is quite similar to OPI DS Original, this would be a good alternative if you don't want to drop $35+ on ebay for a bottle. Formal was beautiful and smooth, no balding and very pretty fine holographic finish. After one coat I didn't think it was going to get opaque, but after three it looked fantastic. This is three coats with no top coat. Girly Bit's are available from her Big Cartel Shop as well as a number of other etailers. 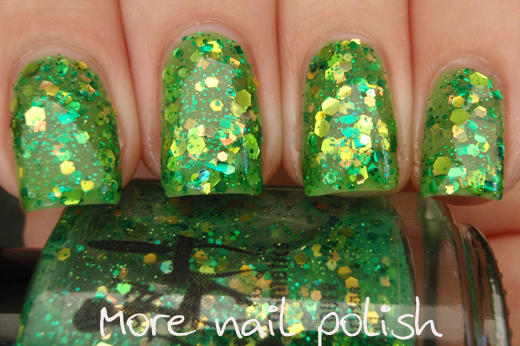 Aussies can get Girly Bit's locally through Femme Fatale Cosmetics. Love Twitterpated, it looks so sweet and delicate! I have more Girly Bits then any other indie, I love her! I am really smitten with Twitterpated (is anyone honestly suprised?)! :) Have a great day!! With the finish type and coloring, I feel like Twitterpated may look more like OPI Sand-erella than DS Original, though those two are also very close. What do you think?